The Tenderloin People's Garden sprouting a healthy crop of greens. 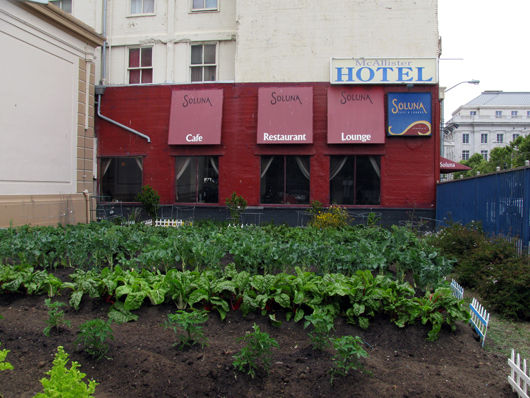 Great example of a micro-size garden working on a community non-profit model. Occupying a tiny corner across from San Francisco City Hall and the Asian Art Museum, the garden is run by the non-profit Tenderloin Neighborhood Development Corporation and distributes the 3000 pounds of fresh produce grown annually to local low-income residents for free. Read more about the garden from the organizers here or in the press here. Below the garden is shown outlined in red, in the upper center of satellite image (all the rest of that green is City Hall lawn! ).